Suri Cruise: Child Or Princess? Take a look at this face. She’s cute. She’s pretty. She looks a lot like her famous mom, Katie Holmes and is dressed so well that she could become a fashion plate for kids, all by herself. I’m sure there are media moguls out there who wake up and wonder what Suri is wearing today. There are few celeb-kids who get the kind of media attention that Suri Cruise gets. 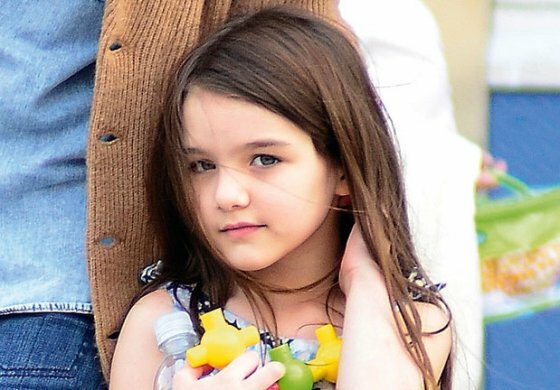 As a matter of fact, besides Michael Jackson’s kids’ latest media rampage on the custody battles going on over them within the Jackson family, Suri may be one of the only celeb kids constantly in the media. But, take a look at those eyes. They tell a story. Suri Cruise with Mom, Katie Holmes, getting ice cream and Mom’s full attention. Sadly, this little girl has been so pampered, sheltered and protected by her famous parents that she doesn’t know the same world that most kids her age already know. Suri is a 6 year-old little girl who’s been so pampered and sheltered by her famous parents that this child is likely to grow up, feeling that the sun rises and sets just for her. This isn’t Suri’s fault. She only knows what she knows because it’s what her parents have shown her. Suri has the best of everything and has been sheltered so greatly that she’s even been home-schooled. The unfortunate part of this is that it is highly likely that Suri has had a lot of contact with other kids her age. She lives in a world of adults. Adult aids, adult nannies, adults around her adult parents and assigned solely to taking care of her and her needs. This not a normal childhood for any child and will likely result in a maladjusted teen and adult down the road. While it may appear that Suri has led a charmed life thus far, it’s clear to see that her world is one that has been hand-picked and created in fairytale fashion for a little princess. It’s as though both Holmes and Cruise have treated Suri more like a prized doll than a child. While no one could ever accuse either Holmes or Cruise of failing to provide the necessities of Life in terms of material needs, love or guidance, one could say that their doting behaviours with Suri, has bordered on treating Suri like a prized possession rather than a child. As Suri is being prepared to go to school for the first time in her life, as most other children do at the age of 4 and sometimes, younger, Holmes has her work cut out for her. This is a child who has been carried around by her parents, having the ability to bury her face in her famous parents’ shoulders to hide from whomever she doesn’t feel like dealing with. This is a child who has been wearing designer outfits and now, must wear a school uniform, looking like every other child around her in that school. She won’t have Mommy’s hand to hold or Mommy to pick her up and carry her, allowing her to bury her face when there’s something she doesn’t like. This appears to be a child who isn’t used to being told “no” to much of anything. A child who has been used to running the show, pulling strings and feeling as though everyone else’s world is contingent upon her needs, wants and whims. This is going to be an interesting, to say the least, scenario to see how it plays out for this child. It will certainly be quite an adjustment for her and everyone else concerned with her daily care within that school. The one thing that Suri has going for her is that Mommy and, perhaps Daddy, are spending $40,000.00 a year tuition for her to go to this private school and is reportedly, only a block away from her home. It bodes well for Suri because it’s likely that no one there wants to cross or upset the “little princess” in fear of wrist slaps coming from her famous parents. No one needs that kind of publicity either especially, a high-priced school that is trying to set up other locations. This is not going to be an easy ride for anyone. It appears as though Holmes is trying to put her foot down with Suri now to get her into a more normal routine and lifestyle. That’s not going to be a walk in the park for Holmes. Suri’s entire life thus far, has been that of a charmed little girl. It’s going to take work to integrate her into a world that doesn’t always pamper or shelter her precious child the way that this child has been used to. I don’t envy Holmes in this task but, my hat is off to her for seeing the writing on the wall and attempting to do something about it now, while there’s still time. It’s certain that we’ll be hearing more about this come September and let’s all be glad that we’re not one of Suri’s teachers nor, the principal of that school. Mom, Katie Holmes, nudging a disgruntled looking daughter, Suri Cruise, forward. At least Holmes isn’t carrying her in this shot and urging her to walk on her own two feet. Are You A Helper Or A Doormat? Seems to me that you’re jealous of Suri and her lavish lifestyle. Oh good heavens. Are you serious or is this a joke Kalya A Andrews? I can’t stop laughing.